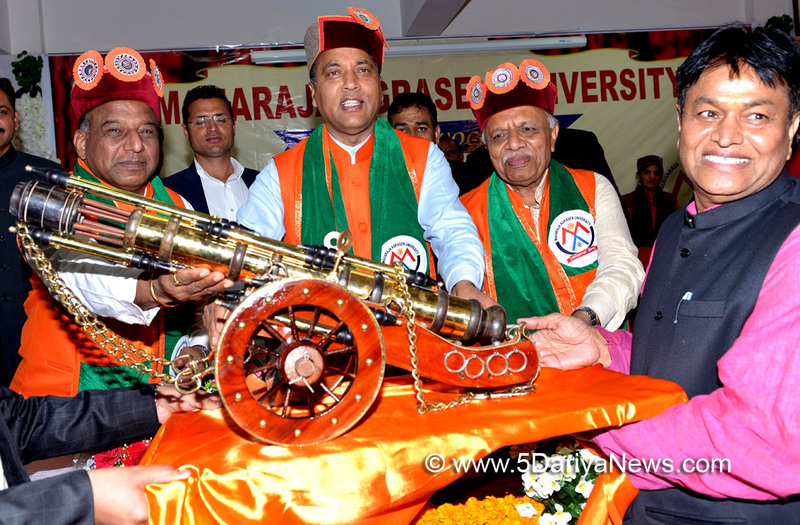 While delivering the Convocation address on the occasion of 2nd Convocation of Maharaja Agarsen University Kalu Jhanda in Solan district today Chief Minister Jai Ram Thakur said that the State Government was committed to make Himachal Pradesh a hub of education in the country and the private institutions were playing a major role in this respect.The Chief Minister said that the University was playing a vital role in supplementing the endeavours of the State Government to provide quality and job oriented education to the students of the region.He urged the students to always be grateful to the values, knowledge and education provided by the teachers. He said that students must always give due respect and regard to their parents and teachers who had made it possible to make their dreams come true.Jai Ram Thakur urged the teachers to join hands with the Government to eradicate the menace of drug abuse from the society. He said that it was the need of the hour that collective efforts be made to make our society drug free.He also congratulated the degree and medal winning students on the occasion. Chief Minister also conferred degrees and medals to the meritorious students on the occasion.Chancellor of the University Nand Kishore Garg detailed the brief history of the University. He said that the University was endeavouring towards imparting quality education in different disciplines to the students of the region.Vice Chancellor of the University Prof (Dr.) R.P Gupta welcomed the dignitaries on the occasion and read out the annual report of the University on the occasion. He said that as many as 287 graduate and 212 post graduate students would be awarded degrees and medals on the occasion.MP Virender Kashyap, MLA Doon Paramjit Singh Pammi, MLA Kalka Latika Sharma, former Minister of Punjab Madan Mohan Mittal, Chairman MILKFED Nihal Chand Sharma, DGP S.R. Mardi, Deans, faculty and students of the University were present on the occasion among others.